This year we went trick or treating with friends! 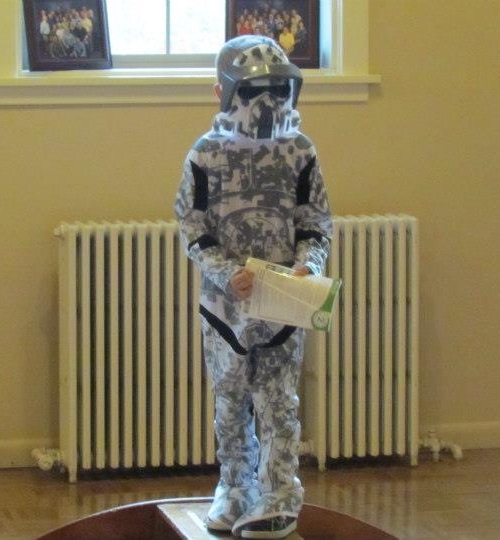 Preston was obviously the cutest little storm trooper you ever did see! The whole gang before we headed out. We got lucky this year on Halloween and it was pretty nice out. Not freezing. Which doesn't always happen around these parts at the end of October. The three big boys got pretty into trick or treating this year. Preston was all over it! It was a good thing that Brad came along, since Preston and his friends kept taking off ahead to get to as many houses as they possibly could! So fortunately Brad took off with them when they'd be four or five houses ahead of us Moms and the two little ones! I grabbed onto my little storm trooper and forced him to take a picture with me before he knocked on any more doors! Does it look like they were having a great time? Because they were! After the kids had loaded their goody bags full of treats, and one pencil (Preston wouldn't allow it in his bag like it would contaminate the candy! HA! ), we headed back! From there we headed over to my parents house for Preston's final trick or treat. He tried to trick my Mom when she answered the door but it didn't work! He may have decided to help himself to the candy! Once Preston had taken his costume off he got into answering the door for the trick or treaters at my parents house. It was so fun to watch him hand the candy out, he got such a kick out of it. And was so serious about making sure everyone got the same amount of candy! We had an awesome Halloween and will be munching on the candy for weeks to come I'm sure! Hope you all had the same kind of night! Preston's preschool class celebrated Halloween with Storybook Day. The kids all dressed up as a character from their favorite book. We did it a little bit backwards and instead let Preston pick his costume for Halloween first and then bought a book to match! He decided he wanted to be a Storm Trooper this year, so I grabbed him a Star Wars book to bring to class...the night before. I like to be prepared! Ha! When we got there, the kids were getting ready for the big show! The took turns standing on the little stage and sharing who they were dressed up as and what book they'd brought with them. Afterwards the kids all stood together for a class picture. And then we had the teachers hop in there too! After all the pictures had been taken, we all headed downstairs so the kids could enjoy the Party part of their Storybook Party. Until they all finished up their snacking and treats and headed away from the tables for some playing. Or some cute photo taking! Brad had to head to Bellingham for a meeting and his boss told him he'd pay for me and Preston to tag along. Not one to turn down a free trip, we said heck yes! It was just for the night so it was a big trip. But we made a couple of extra stops along the way there and back to make it fun. On the way there we stopped in Leavenworth. It's such a cute little town and Brad had never been there. So we parked and everyone got out to stretch their legs and we checked out the shops. Preston found a couple of things in a toy store that he had to have. Once we left the town we had every intention of continuing onto our destination. Only everything was so dang pretty. So we had to pull over at one of the pull offs and take some pictures! When we got to Bellingham we found a hotel and ordered dinner to go from Red Robin. None of us wanted to go sit in a restaurant after being in a car all day. Not gonna happen. We spent the rest of the night lounging around the hotel. We'd gotten there late so there wasn't a whole lot to do. The next morning Brad left for his meeting and Preston and I slept in and grabbed breakfast. We are just so dang exciting. I had requested a stop at the outlets in Tukwila on the way home so when we got back in the car to head home that was the plan! We didn't find a whole lot but the fresh air felt good. And Preston found a ride. We stopped again in Monroe for lunch and decided that we just had to stop at the Reptile Zoo that we had seen the day before on our way over. Preston might have been really excited. He is so into snakes right now and this place had snakes! They had a bunch of the world's deadliest snakes. Preston particularly liked the Black Mamba. Probably because it's the deadliest! We also couldn't keep him away from the rattlesnakes. He loves that they rattle. One specifically there did not like us. I think he felt like we'd snuck up on him. He coiled up and was shaking his rattle at us. Preston was so into it. They also had a giant alligator that Preston thought was pretty awesome! We also saw a two headed turtle. And this little guy. He looked so sweet and innocent, but we were told he was actually very mean and that feeding him and taking care of his was a process. And that once he'd attacked one of their employees and it required a lot of stitches! For a small charge you could hold one of the snakes. So we asked Preston if he wanted to hold one and what do you know he said yes! He was only a little bit excited! After a few minutes he passed the snake off to Brad and found a seat to ask questions to the lady who was working! She was nice enough to pull out one of the lizards for my boys to pet. It was going to be a long drive home since we'd made so many stops but it was totally worth it! We had a great time! And a great trip. Even if it was a fast one! We were a little bit late to Preston's third soccer game. I don't even know what happened, we just could not get out the door in time. And even worse it was our snack day. So not only were we already running late but we had to stop to pick up snack too! And of course that was the game that everyone showed up to. My parents. Siblings. Grandparents. No big deal. Fortunately we were only like ten minutes late and the game ended up starting late so we didn't miss a lot. Just gave my family a chance to really give me a hard time about how I am late for everything. With the crowd on the sidelines Preston was very distracted. And not very focused on the game. He did still manage to score five goals. Not to shabby! This was the game where the crazy competitor in me came out a little too much, particularly for a five year old's soccer game. There was a kid on the other team that kept laying down in front of the ball every time we were about to score. Seriously, it happened like ten times. And I was over it. It was poor sportsmanship and he did it completely intentionally each time knowing that it would stop the game so that he wouldn't get hurt. A couple of times he actually reached out and grabbed the ball while he was on the ground. At the end of the game I'd had enough. 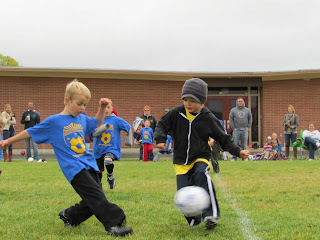 Preston was heading down to score and just as he was about to kick it in, the kid did it AGAIN! I was pissed. And before I knew what was coming out of my mouth I started to yell, "Kick him..." And then caught myself and stopped. I was just done. The kid was putting his face where the ball was and I was tired of that meaning that our team didn't score and the whole game was stopped and knowing that the kid knew that would happen. Not my finest moment. Oops. 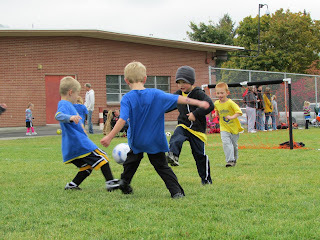 This was also the game where we really began to be over soccer. Preston's coach just wasn't involved and it was so frustrating to us. Even more so because she had told all of the parents that as the coach she needed to be in charge and the kids had to know that so she wanted us to back off. I am all for that. I believe that in sports the players should listen and follow the coach. But that means the coach has to actually coach and that wasn't happening here. I mean practices were like twenty minutes long...maybe. And then the games were an hour. Hmmmm...that makes a ton of sense. Or not. No matter how much we worked with Preston at home and talked to him about soccer none of it mattered when he got to practice and the games and his coach was actively uninvolved but also didn't want the parents to step in. This was really evident by game four. Preston had gone from really excited about soccer and totally involved in the whole game at the first two games, to not caring. The team wasn't really practicing and the coach wasn't encouraging or correcting behavior on the field. I mean in this game the other team's coach was giving her pointers by the end of it. Preston looked cute though, so there is that. It was just tough to watch Preston get worse and worse with each game when he should have been getting better! It wasn't just that he was playing worse either, he was enjoying it less too. And frustrating to Brad and I to see this. Plus all of the bad habits that he was learning that he hadn't gone in with. For example at the first game he played his little heart out and told us he never gets tired. Which is true, he really doesn't. By this game he was taking a water break every few minutes. Why? Because the coach would call water breaks for the whole team every few minutes. At the first game wherever the ball was Preston was. At this game he was spinning in circles because that's what the rest of the team was doing and the coach didn't care. The fifth game wasn't any better. Practice was cancelled before this game. The kids are playing worse and worse so we cancel practice. That makes complete sense! Or not. Which meant that all of the kids hadn't practiced since the game the week before. We were down a player at the start of this game too since for some reason we had started with less players than all of the other teams. And then two of our players dropped out after the first couple of games. And at this game one of our players left at half time, so then we were down two players for the second half. Meaning we had to borrow players from the other team. It was confusing to the kids on both teams. I had coach envy this go around. The other team's coach was AWESOME! The kids played great and knew what was going on and he was there every step of the way with them encouraging them when they had great plays or scored and correcting when mistakes were made. He also told our coach that the kids had JUST started playing and didn't need a water break already and that they took water breaks at the end of each quarter. I mean the quarters were only ten minutes long maybe so that wasn't crazy. I might have told Brad several times over that I wished Preston had been on that team instead. Preston was completely uninterested in this entire game. It was hard to watch and remember how awesome he played the first game and to see how all of that focus and hope for what he wanted from soccer had disappeared. After this game I talked to my Dad about how frustrating it was that Preston's playing seemed to get worse with every single game. My Dad played sports his entire life so he was definitely someone who's opinion I wanted. He agreed with me that Preston was getting worse and worse. And that a lot of the problem was the lack of participation from his coach. That she couldn't tell the parents that she wanted to be in control of the team and then not actually do that. I also told him that I was worried that some of the habits that he was making were going to be really hard to break once he'd learned them. And he agreed. We left this game completely frustrated. The following weekend we had plans for the train ride. We'd arranged it just right so that Preston could play his game and then we could hurry home to change and then head out to ride the train. That was the plan. Until his coach texted me cancelling practice. Again. I'd finally been pushed far enough with this whole thing and was done. Brad and I talked about it and decided that we were done with soccer. We weren't going to force Preston to play when he wasn't having fun anymore because there was no direction. So we told Preston that soccer was over and that we'd forgotten to tell him that the last game he'd played was the last game of the season. I then texted the coach back and told her that we weren't going to be able to make the game because we had family plans. We talked to Preston about sports and which ones he wanted to play and asked him if he wanted to keep playing or not. He told us that he liked soccer but that he wanted to play another time and with a different team. And it was decided that we wouldn't sign up with this league again, ever. The reality is that kids need direction. They need encouragement. They need to be told when there is a better way to do something. Especially in sports. They need an active participant to point these things out. That person is called the coach! We were seriously lacking in that department. And it was a major disappointment to all of us. Preston has decided to do basketball next. And this time we are signing up with the YMCA since we have had great experiences with them and their programs in the past. They have a soccer program too so I think we'll give that one a try to if Preston wants too. Right now it's just a relief for all of us to be done with this league and this experience and to move on. Best Soccer Practice Photo Ever!